Yesterday I started using Evolution instead of Thunderbird 3 in Lucid, and I justed wanted to tell the Evo team that they have done a wonderful job. I stopped using Evo due to performance problems, but many of those issues seem to have gone. I am really enjoying my use of it. I don’t think the Evo team get enough credit for their incredible and hard work on it, so I just wanted to share some public kudos. Thanks, folks! Yup evo rocks ;), there’s even an experimantal imap implementation with IDLE. I guess you are stuck with 2.28 with lucid though ;). 2.30 rocks! @Frej: That’s kind of sad that Lucid won’t be fully GNOME 2.30. I hadn’t realized that was the case, though of course it makes sense for a high-profile application in an LTS release. Evo 2.30 is a huge enough improvement that I’m thinking of switching back, too. Actually the evo in lucid is the same one that was shipped in Karmic because we wanted it to be stable. The deprecation of bonobo in the version to be shipped in 10.10 will make evo a lot faster. I am surprised. I never used Evolution, not because of performance, but mainly because it a) looked horrible b) was just not as up to date in usage, it was in terms of usability stuck in the 90s. aside from Evolution’s superior integration into gnome, what speaks for Evolution? Rock on! Good job evo devs. I see you too have 2 trash icons, I guess you’re using the IMAP backend. Are there any plans, to fix this? I guess it’s mainly a clientimap server dialogue problem. I don’t like Thunderbird’s interface, and I like Evo’s. It’s a personal thing, sure, but there you go. Every time I send email with Evolution it always asks me if I want to send plain text or HTML. Every time. It never remembers my choice. I’m really hoping this is fixed in 10.04. I’m sure there is a fix, but it always takes me months to install a fix. LOL Man, I must be tired on a Friday: Evolution should be Thunderbird! Evolution does it correctly, Thunderbird = Fail. I’m beginning to tire of Thunderbird and Evolution is looking better than I remember. Perhaps I’ll give it another go. That screen shot of Evolution looks really smart with that theme. I may start using it again when I install 10.04. I agree that Evo’s developers should get much more credit for their efforts. It’s probably the most important application for us corporate users, there’s no way to substitute it with for example TB if you need Exchange support. Sometimes I fall back to use Outlook with Crossover Office but always return to Evo due to its overall superiority, in spite of the minor hazzles with the OWA connector. Just hope that the devs push on with their work with the MAPI backend. I already used Gmail, Thunderbird and KMail, and Evolution has been my favorite email application for some years now. Having used Evolution 2.30 for a few days now, I must say I’m more than happy with the IMAP protocol implementation improvements. I can’t imagine how huge was the effort needed to remove the dependency on bonobo, but I hope that, together with the removal of the copyright assignment requirement, this will make it much easier for Evolution developers to add features and fix errors. The 3.x series will see Evolution get even better, version after version! I’ve used Evolution for about 4 years. Evolution rocks! I’m not interested using Thunderbird on my personal computer. But I would suggest to use Thunderbird for everyone who is on transition from Windows to Linux. Because of the inter-operability of Thunderbird. They can use Thunderbird on their ms-windows first, then they can switch to Linux and keep the Thunderbird. 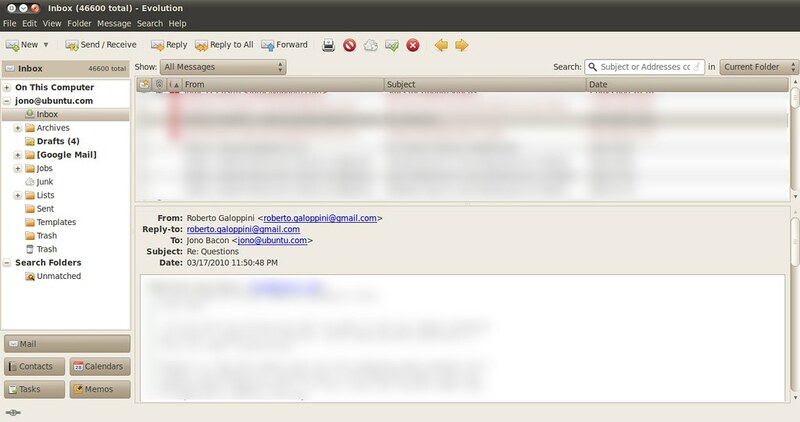 So they will have same UI for mail client. Thanks a lot for the feedback Jono and all for the comments, we are so happy to get this from you 🙂 This really encourages us to make evolution more and more better and beautiful!! I’m using Evo on my laptop and I like it, but there are a lot of strange issues with it, like empty folders showing unread messages. It’s also far too heavy for my netbook and the Thunderbird UI is more netbook-friendly. Is there a PPA for Evo 2.30 on Karmic/Lucid? If it’s lighter it might be worth trying. There is one annoying thing with evolution, which I wonder if it can be solved via some re-configuration. Whereas Thunderbird uses the very user-friendly ‘n’ key to move to the next unread message, in Evolution it’s ‘Ctrl-]’ which requires three keys to be pressed on most European keyboards! Michael Olberg: Next unread message in evolution is also mapped to “.” (previous is “,” which are quite user friendly to use in terms of placement but not very obvious. I’ve been using Thunderbird for a while, but also recently switched to Evolution. One of the pros for me is that it supports my corporate iCal server in a proper fashion. I could not get this to work in Evolution 2.26; and the iCal support in TB2 (Lightning) just had too much issues to be usable. If would be good if the evo devs created deb and rpm packages for easy installation of the latest versions. I think many more users may be inclined to try it and contribute. Has a lot of potential, I keep hearing about the great things in 2.30 and hope to try it out soon. Good work devs! I use Evolution at work because it’s the only way to get my Exchange e-mail, but it is a real pain. I have to start it about three times before clicking on my mail actually displays anything. When it goes to check for updates the ability to read mail breaks until the updates are done. Often it fails to give my desktop notifications of my meetings. I also wish I could minimize evolution to the notification area so it’s only in my workspace when I’m actually using it. My e-mail should get the same tight desktop integration that IM and social networking get.